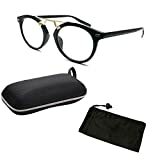 Hard Eyeglass Case | Protects Glasses ..
CPS Retro Style Designer Round 70's Wo..
Yashus Titanium Alloy Glasses Frame IP..
Slv Glasses Frame IP Vacuum Plating Pr..
VisionsIndia Unisex Rectangle Black Su..
Adine Women's Oval Spectacle Frame - T..
Adine Women's Cat Eye Spectacle Frame ..
Adine Women's Rectangle Spectacle Fram..
Gunnar Optiks Sheadog Computer glasses..
Steampunk Metal Frame Round Glasses Pe..
Swadha Glasses Frame IP Vacuum Plating.. If you have wasted enough time in market looking for right pair of eyeglasses, then it is time to sit back, relax and try something online. Yes, e-commerce is a huge market with a base of more than 5 million users. Among the plethora of products, you can surely find eyeglasses for women. Contact lenses have transformed the market lately but some women still prefer the traditional way of wearing eyeglasses. They are not just the need but have also become a part of style statement. When it comes to price, there are multiple options available, both offline and online. One can choose from brands like Titan, Fastrack, Ray Ban, Vogue, Vincent Chase, Tommy Hilfiger, Calvin Klein and many more. One can also search for stylish frames for women eyeglasses. 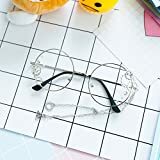 Rimless Eyeglasses: These types of sunglasses are lightest in weight as their lenses are mounted on the bridge and temples. Rimless frames were most popular from late 19th century to mid-20th century. They became a trend when people witnessed Steve Jobs wearing them. Since then, they are popular enough to make a place in top preferences. 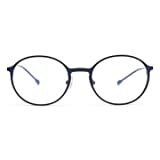 If you wish to buy one pair for your dear one, then use lenskart coupons at CashKaro and get the latest discounted deals. Plus, you get cashback from us. Full Rim: Full-rim eyeglasses are all-time favourites. They are modern, super elegant and comfortable. 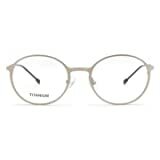 Full rim ray ban women eyeglasses are the bestselling glasses. Actresses like Deepika Padukone, Priyanka Chopra and Alia Bhatt have made them hotter with their frequent full rim eyeglasses appearances. If you want to carry their look, then you can also buy designer eyeglass frames for women. 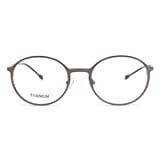 Half Rim: The half rim eyeglasses are another types of eyeglasses which are affordable and stylish as well. Snapdeal coupon codewill help you find the affordable range of half rim eyeglasses for women. Brands like Vincent chase, Cyprus, John Jacobs, Polo Sports, Red Gear, Vogue, Mara Boss, Ray Ban and many more are known for their half rim collections. They are also available in plentiful colours and half rim pink eyeglasses for women are most preferred. Not just for women, the following brands have their roots dug deep into the ground when it comes to sunglasses. Calvin Klein: It is an American fashion brand which manufactures clothing for men, women and accessories like belts, wallets, sunglasses and eyewear. Calvin Klein women eyeglasses are known for their cult design. Ray Ban: From Dabang Khan and Sonam Kapoor to Brat Pit and Jessica Alba, ray ban has always been in the highlights. Their eyewear and sunglasses, both are equally loved by people. Women blue eyeglasses frames are a hot buy these days. Ray ban women eyeglasses not only protects your eyes but also give a perfect look to the face. Oakley: Oakley eyewear is for someone who loves adventures like cycling, scuba diving, dirt bike racing, and skiing. Oakley's eyeglasses are designed with precision and panache. Oakley women's prescription eyeglasses provide good care to eyes and help identify the loop holes in your journey. Buy them online from retailers like Amazon and Flipkart. 1. Create an account on CashKaro or simply login via other accounts. 2. Search the store you want to make a purchase from. 3. Browse through the updated offers and coupons and click on the Offer you like the most. 4. Shop normally at the retailer store. And that's it! You will get your cashback once it is confirmed. So, now you can buy women sunglasses online and get cashback on every purchase. Please check 99lens site for Exchange Offers available. Please check Coolwinks site for Exchange Offers available.